This week the theme word at TAW is FLY. It occurred to me that there must be a moment when a woman thinks she is old enough to fly whenever she wants, fly meaning whatever she wants. 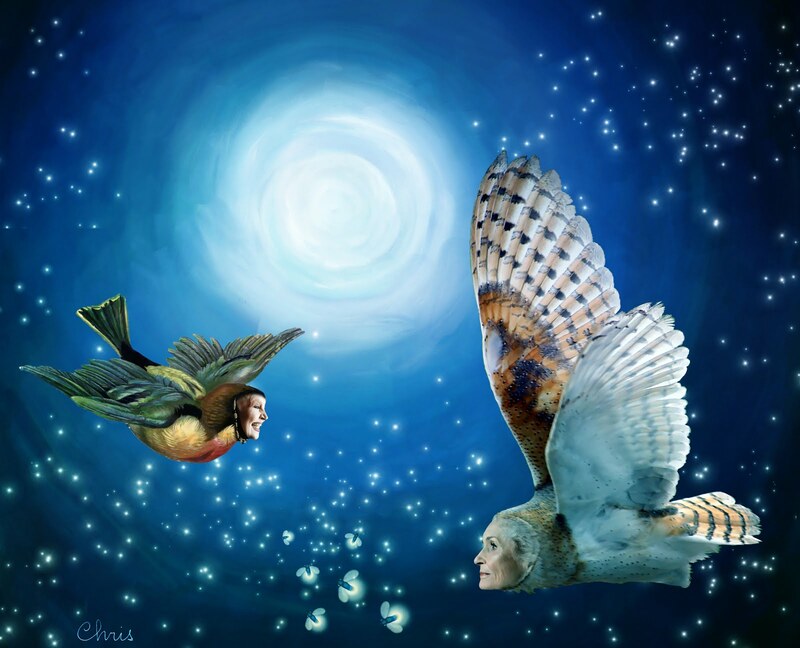 Ladies: Elke Maravilha (Brazilian actress, 71) and Daphne Selfe (British model, 87); Sky, stars, fireflies and overlay: Createwing Designs; owl: hyperactive activate; bird: Graphics Fairy. Love your flying ladies, Christine! Wouldn't it be a wonderful thing to morph into a bird and take off into the sky without a care in the world? This is superb, Christine. I love your artwork. WOW what a marvellous fanciful myterious art work! LOVE your interpretation of the FLY them, Christine, powerful piece! Oh I love this surreal fantasy-fantastic Christine! I love this it is gorgeous whimsical and clever...great job. A great fantasy, beautifully presented! This is amazing. I've just subscribed to your blog.